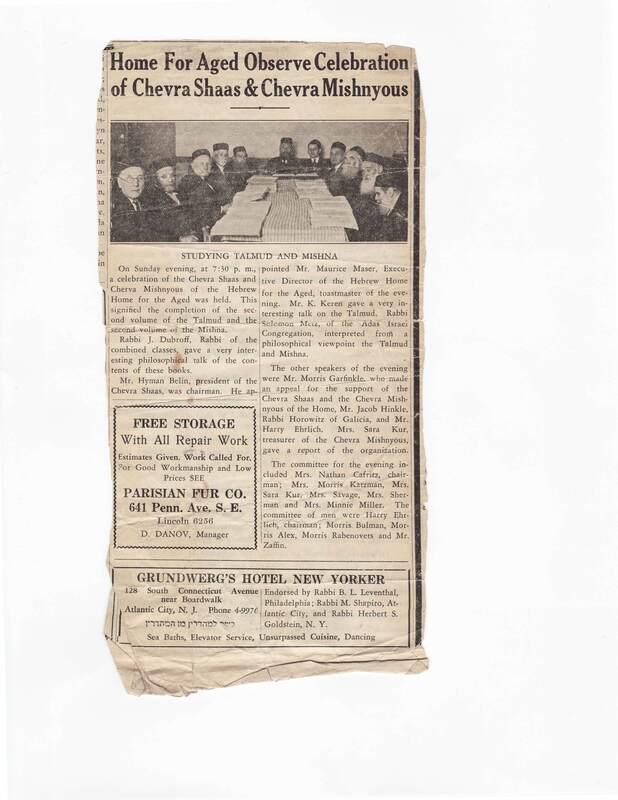 In the winter of 1910, six merchants living in Georgetown, met to discuss the “possibility of forming a Hebrew society for worship and other communal activities.” Joseph Bremmer, Joseph Scher, Max Whitkin, L. Brenner, Mr. Rakysen, and Mr. Gamzy, all Eastern European immigrants, founded the Georgetown Hebrew Benevolent Society, based out of the home of Harris Levy on 28th and M Streets, NW, with “about 25 persons.” On March 16, their registration application to the DC Department of Consumer and Regulatory Affairs as a domestic non-profit corporation was approved. Their first president was a man named Abe Mostow. We don’t know much about Mr. Mostow and the other founding families, but we do know that thanks to their efforts, we enjoy a wonderful Modern Orthodox shul and can celebrate the seeds of community that they planted a century ago. By 1911, for their first High Holidays together, they moved to 3062 M Street, NW, a larger space located above a storefront. They borrowed a sefer Torah, hired a cantor, sold tickets for $3 each, and began holding religious services. Over time, their numbers increased, and “out of a small khevre grew a large farein”—from a small group of 25 people, they became united as one community. 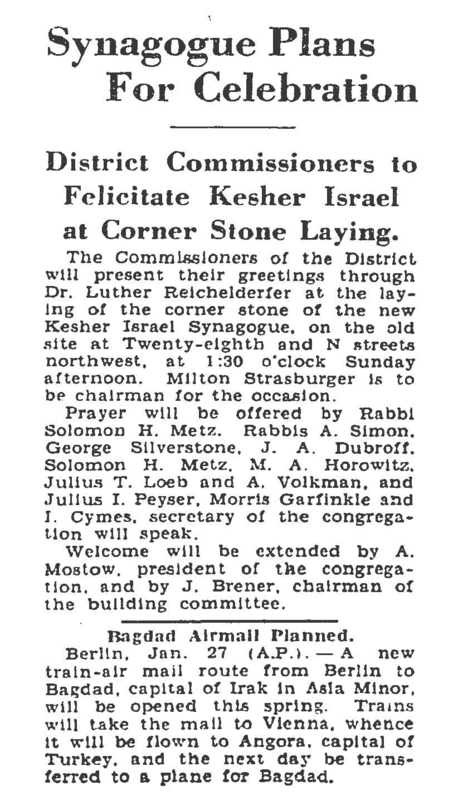 In 1915, the leaders of the community purchased a small house at 2801 N Street NW, converted it into a shul, and renamed themselves “Kesher Israel Congregation.” Over time, the society outgrew the small house and the need to expand became apparent. With a membership of 150 people, and a Ladies Auxiliary that raised $10,000 (a lot of money in those days!) for the building, the cornerstone of the new building was laid on February 1, 1931 and a new chapter began to unfold. On September 6, just in time for Rosh Hashanah, the new Kesher Israel Synagogue of Georgetown formally opened its doors. 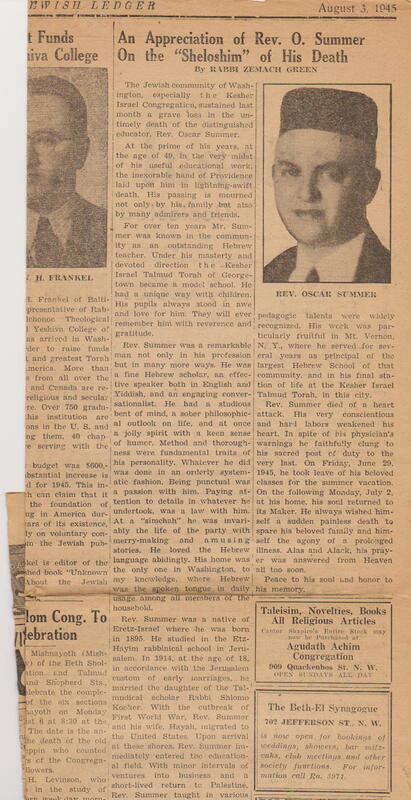 Kesher Israel hired its first rabbi, Rabbi Jacob Dubrow, in 1925. He was quickly embraced by the community as their spiritual leader. He learned daf yomi with the congregation and at the Hebrew Home for the Aged every morning and established a Talmud Torah school under the leadership of Rabbi Oscar Summer. After Rabbi Dubrow’s passing in 1944, two different rabbis served the congregation until 1950, when Rabbi Philip Rabinowitz “brought the traditions of the disappearing world of the shtetl” to Kesher Israel. For 34 years, until his most untimely death and tragic murder in 1984, Rabbi Rabinowitz tended to the needs of his congregants—through the lean years of the 1950s and 1960s, when a morning minyan wasn’t close to guaranteed, to the late 1970s and early 1980s, when the community just started experiencing a rebirth. A man of extraordinary loving-kindness, humility, and decency, Rabbi Rabinowitz spent his years at Kesher focused on three things: to study and teach Torah, to sustain the daily minyanim, and to watch over the welfare of his community. His home was always open to anyone in need, even strangers, and he helped assure that the community was immeasurably enriched in many ways. Rabbi Rod Glogower served as rabbi for a few years and Rabbi Dr. Barry Freundel was selected to be the next rabbi of Kesher Israel in 1988. Throughout the next two decades, Kesher Israel became a beacon of modern orthodoxy and a shul that sees traditional Judaism as essential, while also understanding the value of modern society. Today, Kesher is known for its warmth and hospitality, and its atmosphere of learning and intellectual rigor. During the 1990s and early 2000s, Kesher Israel experienced growth in membership and the expansion of the congregant demographic to include college and graduate students, young professionals, interns, couples, families, and retirees. During the 2000 U.S. presidential election, the synagogue attracted media attention with the nomination of its longtime member, Senator Joseph Lieberman, to be the Vice President of the United States. Today, Kesher Israel’s membership includes multiple current and previous elected officials, a significant number of Ambassadors, both to and from the United States, current and former Cabinet members, and several distinguished authors. Herman Wouk, Leon Wieseltier, Senator Lieberman, and many others have walked through our doors and made Kesher Israel their home. Kesher Israel enjoys visitors daily from all over the world, including government ministers, Knesset Members, and Supreme Court jurists from Israel. Most famously, Israeli generals and then cabinet officers Moshe Dayan and Ezer Weizman, along with members of the Israeli delegation, attended Kol Nidre services at Kesher Israel on October 10, 1978. Each was honored by being called to open the Ark. Two days later, they commenced discussions with Egypt at Blair House in an effort to find solutions to the unresolved issues following the Camp David negotiations. All eventually led to a peace treaty between Israel and Egypt, signed on March 26, 1979. The many authors who have prayed at Kesher Israel characteristically applied memorable words to our synagogue. This includes Wouk calling Kesher "the best little shul in America," as well as Wieseltier's moving descriptions of moments in Kesher's beit midrash in his best selling book "Kaddish." Kesher Israel is proud to be a place of warmth and hospitality, and a place with an atmosphere of learning and intellectual investigation. That is the heritage Kesher Israel will carry proudly into its second 100 years.